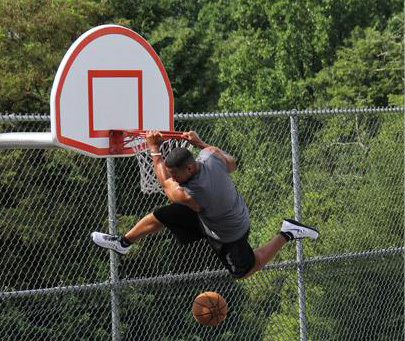 Brandon Todd is 5’5’’ and he can dunk. He has been focusing on bringing his vertical explosion circuit training to the masses. He’s transformed his body over the course of a few years, gaining over eighty pounds of muscle, increasing his vertical, and maintains less than five percent body fat. Todd hopes to teach others that through hard work and perseverance physical limitations can be overcome. “FIVE-FIVE” showcases Brandon’s training regiment and promotes the idea that through hard work you can achieve your goals. The viewer will see that Brandon is not an overnight product or manufactured, but a self-made success. Brandon’s interview is used as a narrative of motivation and encouragement to the audience to think beyond physical limitations. "I've done all these things not only for myself, but for all of you that have been counted out, been laughed at, been picked last. Your biggest hurdle isn't your opponent, it's yourself." Creatively, it was important to tell Brandon’s story and not overly sell a product. By telling an inspirational story and displaying the spectrum of difficulty Brandon had to overcome, the viewer becomes invested and aligns their struggles with Brandon. This motivational approach is highly effective and has touched many viewers. The goal of the final product is to tell a story of motivation and inspire the viewer. It should also give potential clients some sense as to what they can expect when training with Brandon. The final mini-doc was distributed through social media outlets with a heavy visibility through Twitter, Yahoo Sports, The Atlantic, Vimeo and many blogs. “FIVE/FIVE” was given to a prison systems and hospitals to be viewed on their closed television networks to promote health and motivation. “FIVE/FIVE” has received many awards including a Silver Telly and was a selection at the International Gold Coast Film Festival.